Photos today don't look like the photos from my childhood. Photos today are sharp: they zing with colour and they zoom in close. They show one beautiful smile, or a pair of sparkling blue eyes; a snowflake, or a golden autumn leaf; or a favourite pair of boots scuffing it up among the daisies. The photos from my childhood don't look like that. The smile? You'll see it along with that bargain anorak we bought from the shop run out of Mrs Orr's living room (but that's another story); the leaf? you'll see a garden full of them, and a greenhouse, and probably our old Siamese cat somewhere in the middle. Those are the photos with rich details. Crop? In those days? Hardly. I love today's look. I do. I love zooming in on the little things and pulling one tiny detail into sharp focus and telling one story out of something which might have been lost. 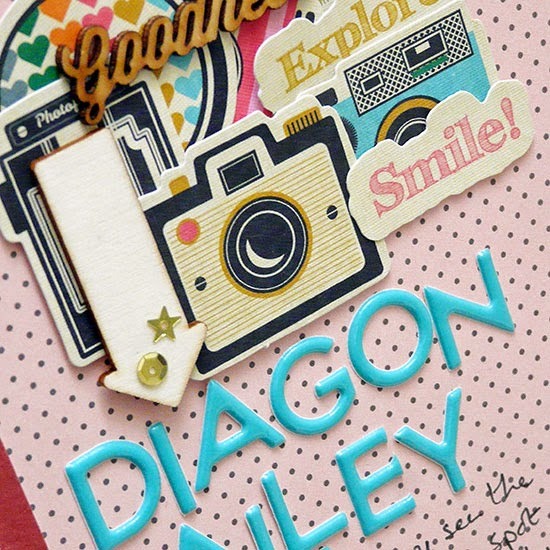 Those photos can make gorgeous scrapbook pages too, with their strong focal points and no distractions. But I do keep reaching back to the pictures with it all - the cluttered backgrounds, the tiny figures in the middle, the stuff. Because often I think if we cut it all out, we're in danger of losing part of our sense of who we are. A story about me making rose petal perfume in our garden? I like to see the whole garden, our long, low 70's bungalow, my sister, my brother, my cat (that cat again), the blue plastic bowl we used for manufacturing - all of it. Because that's who I was, on that day I crushed roses. It was - am I really going to say this? Yes, yes, I am....it was magic. Pages at Get It Scrapped. I agree with you about older photos, they bring back such memories but we are so lucky being able to record things today and our children are so lucky to have those memories documented. What a fabulous page & I've enjoyed reading your story today - about photos then & now! We're heading to Harry Potter World in November & your layout makes me even more excited about our trip! Stunning!!! Love the colours, the twine, the letters, just ALL of it really! You've got those old photos spot on with your description. Always a person in the middle of the photo, always smiling, not really any natural poses from what I recall, more of a stand there and ... cheese! But yes, we do see the whole picture and not just one element. There's a place for both definitely. Let's remember to zoom out as well as zooming in. Exactly! I'm so glad that the photo taker of my childhood had all those extraneous details in there. Although I wouldn't dream of taking pictures like that myself today! I remember being told, during my O Level, that there were three rules in photography: Get closer, get closer, get closer! I do agree about old photos....and that is just how they were....sadly I have too few of them....though I have to admit....I do still take some of those type of photos today. I do love how you've used the twine in this one. Your page is lovely and I love the tangled twine. A beautiful photo and I love your thoughts on the photograph comparison. Very true. Todays photos may look better but they don't say as much. I love scanning old photos for all of the details in the background. Gorgeous layout - love all the little tiny details and how you mix up so many embellishments. You make a good point about background clutter. In my project life photos I do show some of it as I want to preserve the memory even if I don't love the photo clutter. On the whole I try and avoid it because I suppose I am ashamed of the corners that need decorating, the tidying up that should have been done and maybe, just maybe, an area that needs cleaning (heaven forbid). You are right though, I bet the kids will zero in on something in the background that will spark a memory. What a glorious page! I do like your cluster pulling all the colours together. My DD, about twice the age of your DD, has just been to the studios in London and loved it - magic indeed. And as for the background details? I'm right with you on this. Context can be everything. Sian, this is truly fabulous post and so true. I often think the same thing - & I think with the lack of bg we get rid of the imagination - what's going on there? - too...I loved looking at old photos, with the expressions of peeps in the bg, what they were doing. oOu can make up such stories! BUT they do distract, often, & that's what to 'go' is today. Not to distract. LOOOVE your 2 separate clusters...that sign post is PERFECT & the twine all bundled up, GORG....& such a great photo. Magical. Of course!! You're so right about the old photos, and the saddest thing is how few of them there were. As always, you captured a wonderful moment in your layout, and gave all of us food for thought! I love this post. It's so true. I love the picture you did use, it's a moment captured perfectly. You did it proud. Love the layout Sian....and I am now thinking about my own rose-perfume-making-days...and nodding my head in agreement about these old photos! Another great layout! I love those tiny sequin stars---keeping it magical! Michelle - thank you! I'll print out some rose petals pictures and see what comes to me. 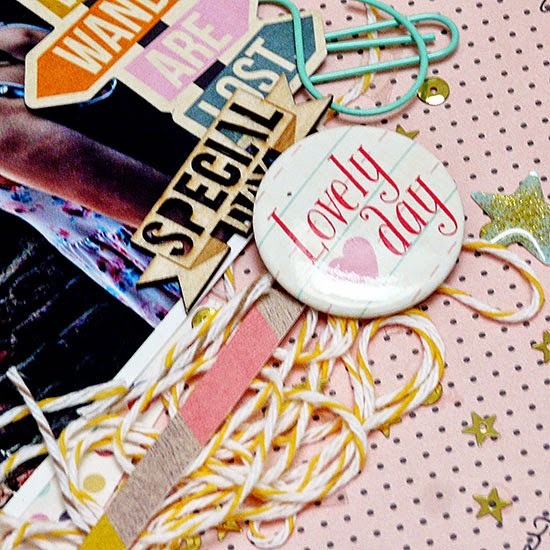 I scraplifted this layout - check it out here: http://melissagross.blogspot.com/2014/10/scraplifting-weekend-1.html. Thanks for the inspiration! What a great post - really made me think about my photos,mr hen and now. Also made me remember making rose petal,perfume with my sister and also 'cooking' with mud, leaves, petals and water in the back garden. No photos unfortunately but the story could still be scrapped - hmm, now I might have to do that! This is a really lovely layout too. Love your clusters on this page - well done. Another great layout and a post that had my childhood pictures flashing before my eyes! A beautiful layout Sian and wonderful writing. I quite agree, I love todays photos cropped and detailed, but I think I will regret not having the clutter and space surrounding it sometimes. Today my granddaughter took a photo and my immediate thought was to crop me and my daughter so that the pushchair and other unwanted background wasn't part of the picture. But then I thought that not every photo needs to be perfect, it is a captured moment and representative of my day. So that's how the photo will stay. And I will be taking more like that, because like you say, the blue bowl or other detail can often evoke powerful and happy memories. Oh what a great post Sian and such a neat looking layout! You are so right about old pictures. I remember when I first started scrapbooking (early 90's) and the CM rep wanted us to crop everything. I'm just happy that I still have negatives for those pictures. I'd hate to think if I'd cropped some real old ones.